If you are struggling with a problem and you need help but you're not ready for coaching and would benefit from counselling, Hugh Driskell offers an international telephone counselling service. Hugh is based in the UK but available to offer insightful, expert counselling worldwide. Counselling with a caring, experienced counsellor might be just the help you need. A few sessions with a professional Christian counsellor on the telephone or on Skype may be all you need to get your life working again. Do you need to talk to a counsellor right now? Phone Hugh, and if he is free you can arrange to talk straight away. It’s as simple as that. You can talk to Hugh from the comfort and safety of your own home at a time that suits you. No waiting list, no receptionists, just a direct line to a friendly Christian counsellor who is qualified to help you. I know that trying to arrange counselling can be a challenge. Arranging everything through a doctor can take months and when you have a crisis you need to speak to someone who will listen to you and provide counselling immediately. When you work with Hugh as your counsellor you can talk through your problems when you need to within reason. Telephone counselling is an effective and affordable option. You don’t need to leave the comfort of your own home and you save on the time and expense of travelling. For 50 minutes, usually once a week, but it’s very flexible, and you can create a schedule that works best for you. What about confidentiality, I want to be sure that everything I say is private? This is very important to Hugh too, and is a cornerstone of his Christian counselling practice. Get in touch and arrange a mutually convenient time to talk through what will be the best option for you. Then you can arrange your first session and get started on the road to recovery. Easy, because you can have a session at any reaonable time, anywhere you want – from home or wherever you can get a wireless internet connection. Affordable, when you think about how much it would cost you to travel to see Hugh, and when you think about what it is costing you to stay as you are. You know the value of your peace of mind, your relationships, your health, and your work. I'm sure that the nominal fee that Hugh charges will be well worth it. Risk-free, because the first 30 minutes are free and you don’t need to pay Hugh anything unless you decide counselling with him is the right thing for you. The initial 30 minute session is available for free to help you decide if counselling with Hugh is the answer for you. From then on, sessions are £35. ( $49) for 50 minutes. If you've been trying to manage on your own and sort yourself out but not been able to, help is just a phone call or email away. You can start talking things through with a caring Christian counsellor today. Telephone counselling, and online counselling via Skype are very effective. You might be wondering if your problem is really big enough to need counselling. The fact that you’re looking at this site suggests that you are having problems or that there is something you are desperate to change. Counselling will help you to make the changes that will make your life work better. Some people only need a few sessions. Others find it useful to have a session every now and then. Most people find it helps to work with Hugh every week for a few months. You know yourself best and can decide how often or how many sessions you want. To arrange face to face counselling, telephone counselling or online counselling using Skype, please don’t hesitate to contact Hugh. Reach out today, help is just a phone call away. Hugh gently helps you to face reality and tap into your inner strength to deal with life's challenges. He is a kind, insightful Christian Counsellor who helps you to see things for what they really are and find ways of dealing with them that work for you. Counselling with Hugh will help you to make positve changes that transform your life. I have no hesitation in recommending his counselling services to you. I'd like to offer you a FREE Life Coaching Guide so you can start making changes immediately. Just enter you first name and email address so I can send you my free guide. It will inspire and equip you to start transforming your life straight away. You will also receive a free subscription to The Five Minute Life Coach, a small dose of inspiration and encouragement to help you on your journey. There is no catch. The resources are completely free and without obligation. So don't hesitate. Your e-mail address is completely secure with me. There is a link to free resources in the book. 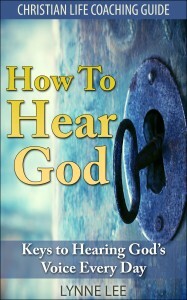 They are included for people who want to go deeper in their how to hear God journey, they are worth way more than the price of the book. I trust that you will be richly blessed.